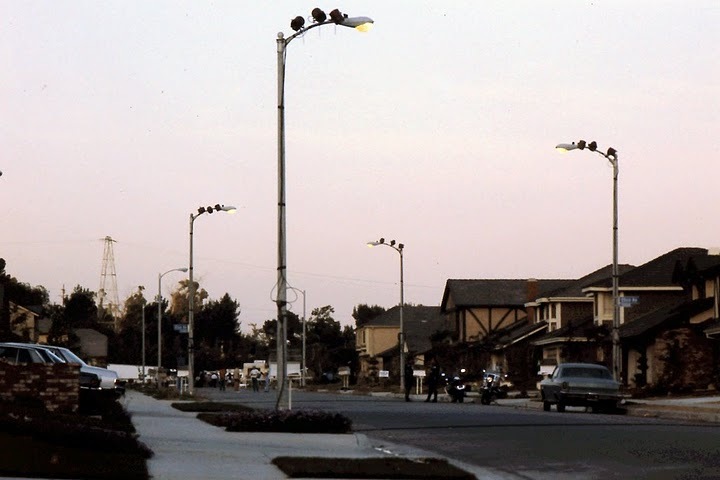 These photos were taken on and around May 15, 1985 on a residential street in Chatsworth, CA. 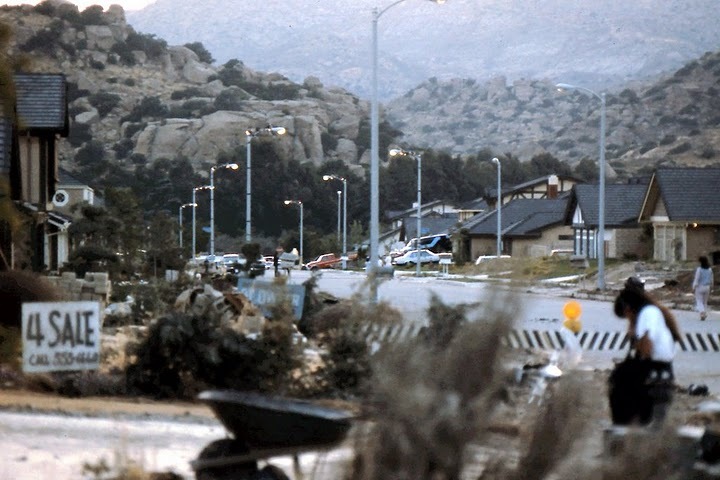 MGM needed a street that looked similar to the location in Simi Valley that was used in the original film, but that also had an empty lot to stand in for the lot where the Freeling's house had once stood. 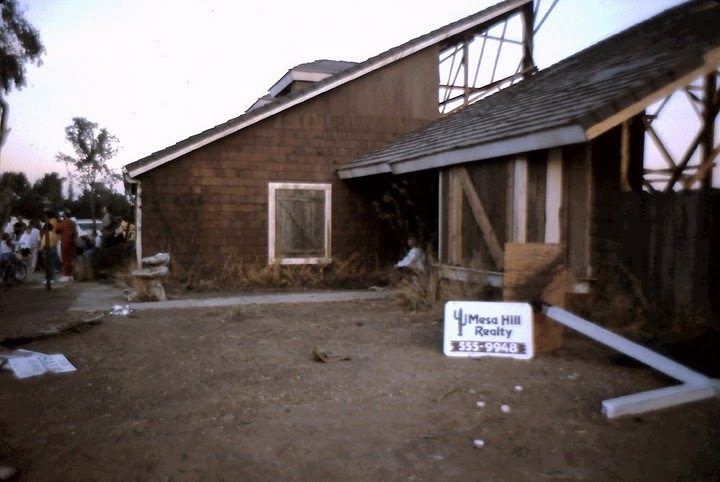 As you can see from the pics, a facade was constructed for what was supposed to be the boarded up house next door (other facades appear to have been constructed as well, perhaps to stand in for the house on the left and the homes directly across from the Freeling lot). 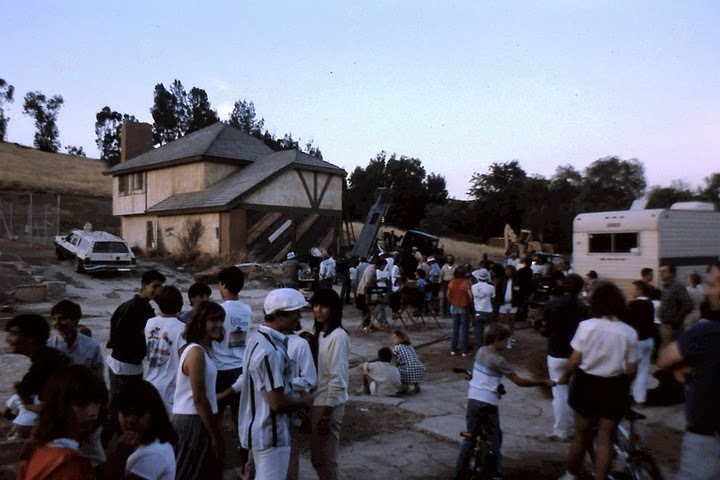 The residents of the street (Mr. Jacobs' family among them) got to watch the filming, and also got to have their own homes made to look like a ghost town, with boarded up windows and "For Sale" signs on the lawns. Mr. Jacobs generously shared with me the backstory on the photos (see below). 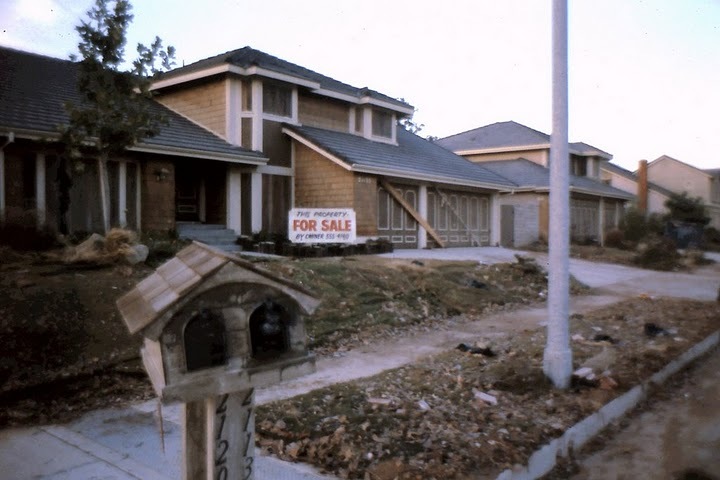 "For Sale" signs suddenly appeared in front of every house on the street. I don't think the "Condemned" stamp is viewable in the film...but a nice detail here. Mr. Jacobs' house is at the far end of the block, just this side of the red pickup truck. 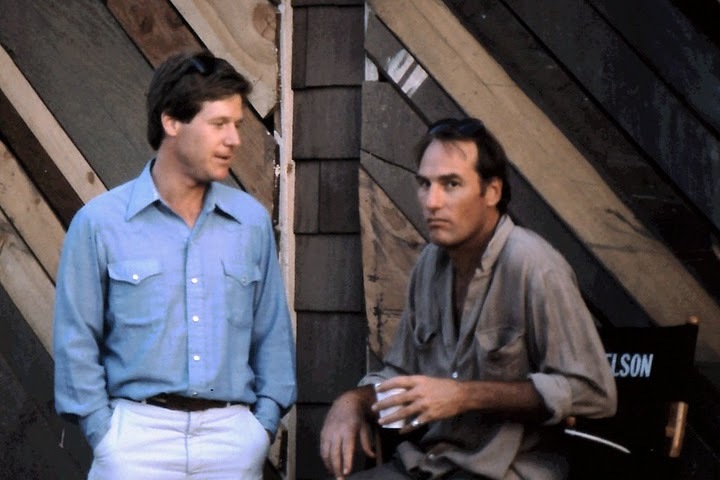 Not sure who the guy on the left is. Craig looks a bit unhappy to be there. 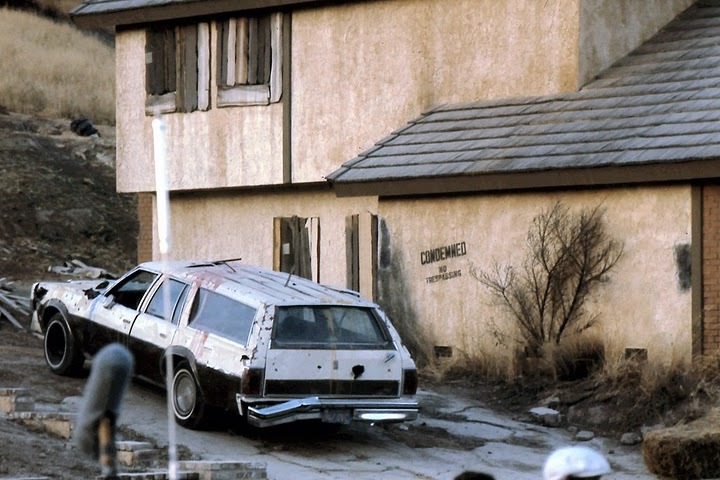 This is to answer your question about the filming of Poltergeist II on our block in Chatsworth, California, in May of 1985. We lived at 21329 Celtic Street in Chatsworth (marked 'A' on the aerial photo below). The false-front structures were built at the east end of Celtic, at the intersection of Variel Avenue. At that time Variel did not extend north of Celtic, and the property east of Variel was completely vacant. The athletic fields and sport courts east of Variel in the aerial photo did not exist. 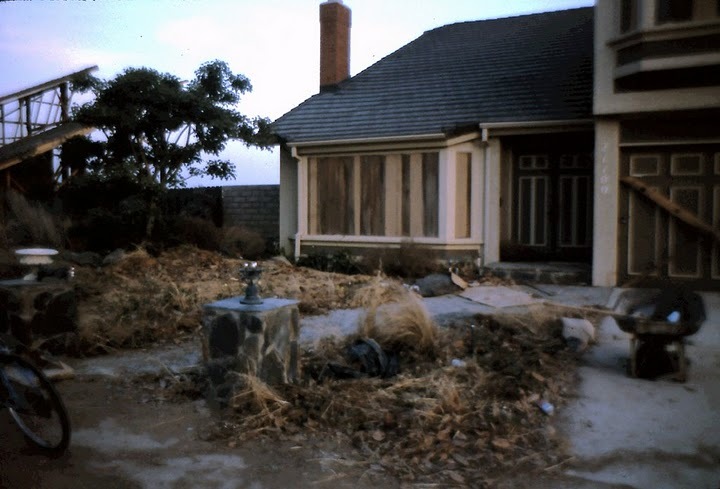 'B' is the location of the hole in the ground marking the "Freeling home"; the locations marked 'C' are the false-front house next door (with the "Condemned" sign on it) and across the street. 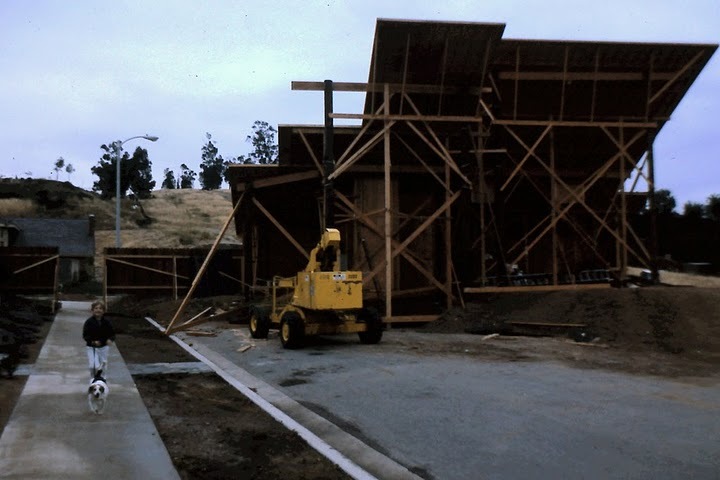 MGM used a temporary paving substance to make it appear that Celtic Street extended further to the east ('D'). 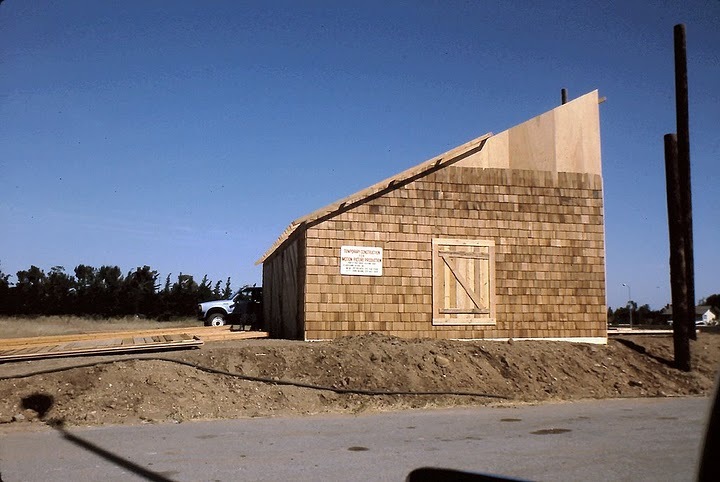 When our house was built in June 1984, we were told that the property was on the site of an ancient Indian settlement, dating back approximately 3,000 years. Therefore we had a grading restriction on our deed. Only three lots (ours, the corner lot to the west of us and the lot up the hill immediately to the north) out of 153 in the tract had grading restrictions in the deeds, which required that if we dug more than five feet down we had to have a qualified archaeologist and a representative from the tribe in attendance, and any artifacts belonged to them. Naturally our friends jokingly told us, "Go see Poltergeist!" Well, frankly, we're not fond of that genre of film -- but as it turned out we didn't have to go to the film, because less than a year after we moved in, Poltergeist II came to us. I did send a copy of the grading restriction to the MGM location manager so he could appreciate the irony. The "Cuesta Verde" sign is in front of a house identical to ours, on the northeast corner of Celtic and Eton ('E' on the aerial photo). 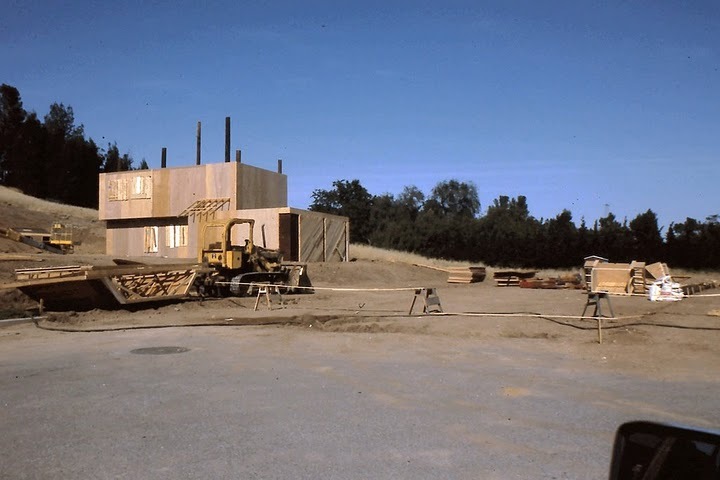 It was convenient for the producer because the owner had yet to put in any landscaping (and it looked horrible even before it was used in a horror film!). We all received letters from MGM explaining what was going on. Nevertheless it was still a surprise to come home from work one day and find "FOR SALE" signs (all with "555-xxxx" phone numbers) on every house on the street, including mine! 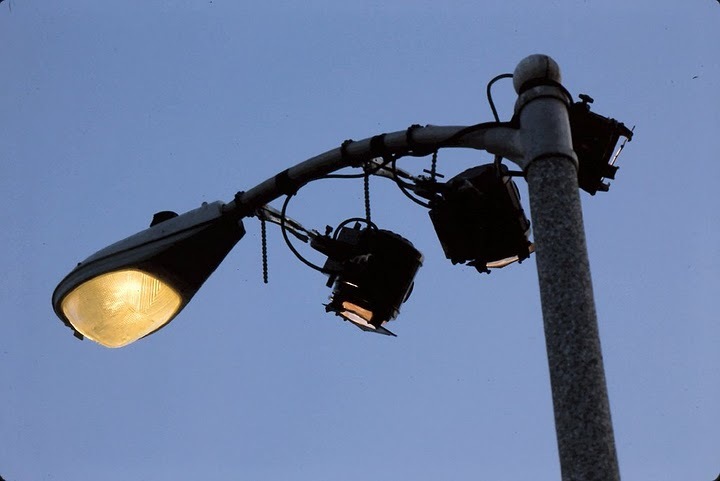 MGM arranged with the easternmost five or six property owners on both sides of Celtic to allow them to mess up their front yards and the fronts of their homes. Mailboxes were loosened and displaced, decorative glass lanterns were broken, and landscaping was covered over with burlap and debris. MGM nicely asked all of us to keep our cars out of sight on one particular day -- either put them in the garage or park them around the corner. One family on the south side of Celtic, however ('F' on the aerial photo), always kept their old blue Ford Fairlane out at the curb, and they were away from home for an extended time. 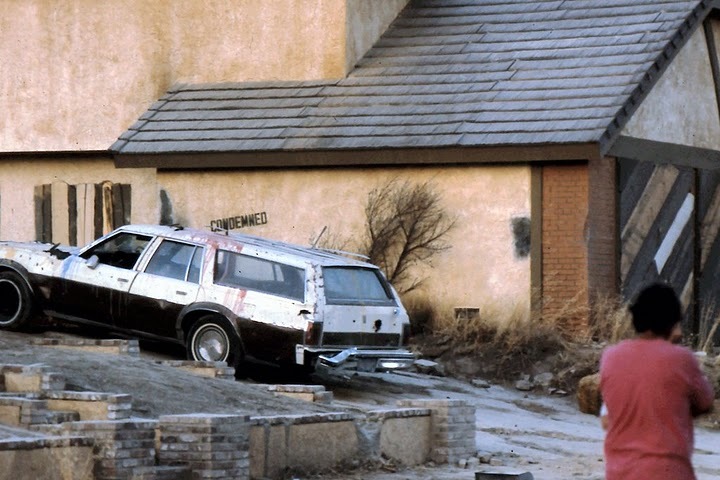 Because there was no (legal) way for the car to be removed, MGM's special effects people just did a quick dress-up to make the car look like it had been abandoned for two years. 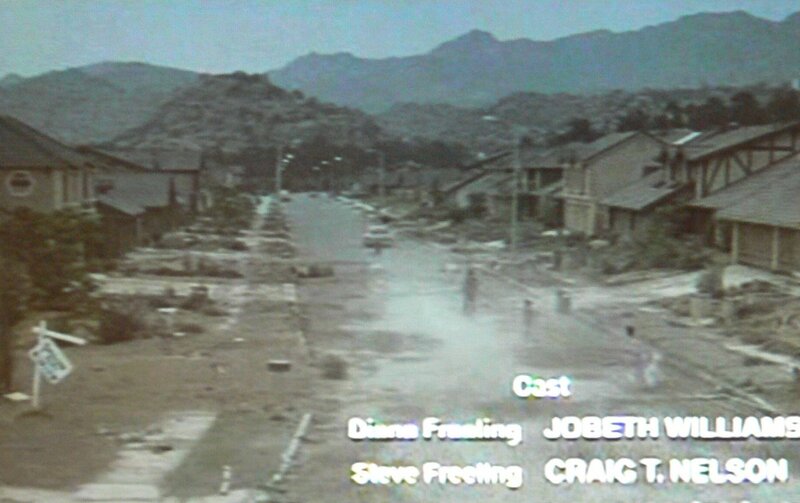 The closing credits begin to roll as the Freelings' Oldsmobile station wagon drives away westbound on Celtic Street. Stoney Point, a sandstone outcropping popular with local rockclimbers, is clearly visible directly ahead. The horrible Metrolink commuter train collision of September 2008 took place at the base of Stoney Point, just 1100 feet from our house. In the screenshot below, what appears to be a gap in the sidewalk on the left side of the street just beyond the dangling white "For Sale" sign is where Variel Avenue was covered over with dirt, and everything below the word "Cast" in the screenshot is the fake pavement. Funny coincidence -- just as I was typing the last paragraph, the TV show "House Hunters" was showing the house at 21341 Celtic -- the one on the corner next to ours! We sold the Chatsworth house in 1995 and we now live in the Pacific Northwest.